Nowadays,rotary evaporator is widely used in factory and laboratory. It is mainly used for concentration, crystallization, drying, separation and solvent recovery in pharmaceutical, chemical and biological pharmaceutical industries.However, in the process of distillation may encounter a lot of difficult problems, such as: low distillation effect, distillation collision phenomenon. However, how should we solve these hard problems? There are four things to consider before buying a rotary evaporator. First:What is the amount of distillation of the rotary evaporator? Second:What is the expected distilled solvent? Third:What’s the boiling point of the solvent? Fourth:What is the number of samples to be distilled? 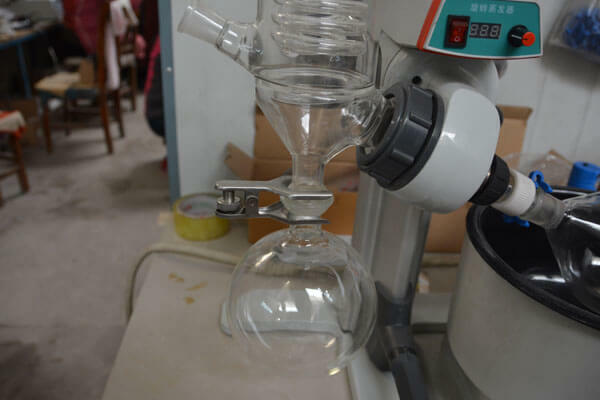 Once you’ve determined the experimental requirements for distillation and the type of solvent, you can start buying rotary evaporators.However, in the process of purchase, we should also pay attention to four issues. Develop a clear rotary evaporator specification.the specification of rotary evaporator is determined by the value of the flask.The size of the evaporator depends on the number of materials.In general, 2L, 3L, 5L rotary evaporators are suitable for small laboratory tests; 5L, 10L and 20L are suitable for medium test; And 5L, 10L, 20L are suitable for medium scale test and production. 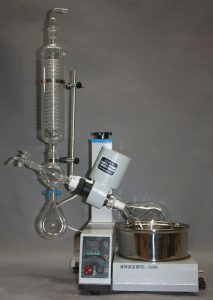 Specify the number of distillation tasks required by the rotary evaporator.Distillation efficiency is critical, and it determines the number of samples that need to be steamed in a single day.Under the same conditions, the higher efficient the distillation, the more samples can be distilled. Here, I want to explain again some factors that affect the efficiency of distillation, such as the degree of vacuum in the system, the temperature of the heating pot, and the temperature of the cooling medium. It is necessary to assess the security risks that exist.The main risks of distillation mainly come from the distillation solvent and heating medium.If the heating medium is silicone oil, the ignition temperature is 25 ° C higher than the heating plate temperature. Distillation solvents with flammable, explosive, explosion-proof glass components are preferred. After the distillation is complete, it is correct to choose automatic deflation so as to avoid manual deflation that may cause an explosion. If you need to optimize the laboratory, the auxiliary condensing unit can maximize the recovery of the distillation solvent, which is also an excellent choice. After-sales service is an important reference standard when purchasing a rotary evaporator. With the development of science and technology, the products made in China are highly competitive in the market and have attracted wide attention. At the same time, the products made in China have favorable price and quality guarantee. This entry was posted in rotary evaporator used. Bookmark the permalink.